The castle du Marais was built by at the end of the XVIIIth century by Mr. Le Maistre from the plans of the architect Barré . Situated near Saint Chéron in the Essonne, the site had previously been occupied by a feudal castle of which it subsists today a round tower, reconverted to dovecote. 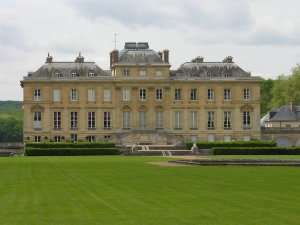 Meanwhile, the property belonged to Sully, Minister of Henri IV. Duchess De Talleyrand acquired the domain in 1899 and began big works of restoration. The park is very pleasant and the mirror pond where is reflected the majestic figure of the castle is the second biggest ornamental lake in Ile de France behind the Grand Canal of Versailles. The outbuildings built on the foundations of the ancient castle shelter a small museum mainly dedicated to M. De Talleyrand.